Inspired by the candied pistachios served on my frisée salad at Club 33 in Disneyland. Mix together the sugar, water and salt. Set aside. Preheat oven to 350º F. Line a rimmed baking sheet with parchment paper or a silicone baking mat. 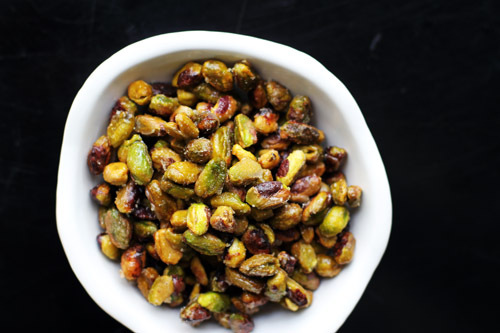 When oven is heated, stir sugar mixture well then add pistachios. Stir to coat all the nuts very well. Spread pistachios evenly on the baking sheet, spooning them onto the tray rather than pouring straight from the bowl to minimize extra sugar mixture pooling on the tray. Bake for 8 minutes. The sugar should be bubbling on the tray. Remove from oven and immediately stir the nuts around on the tray with a rubber spatula, making sure all those nuts get a nice coating of bubbly sugar. Spread the nuts back out evenly so they are either not touching each other or just lightly touching. Let cool completely. Serve over salad or ice cream or cake or whatever suits your fancy! At Club 33 they served these nuts on a salad with avocado and strawberries and a buttermilk dressing I wish I could replicate.